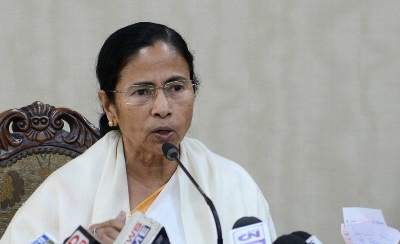 Kolkata, Aug 24 (IANS) Urging people to ensure communal amity during the coming festival of Durga Puja and the observance of Muharram, West Bengal Chief Minister Mamata Banerjee on Wednesday warned that some vested interests could try to foment trouble to promote their political interests. Banerjee said with Muharram slated to be observed a day after Dussera or Bijoya Dashami, the administration had fixed September 30, as also October 2-4 as the dates for immersion of the idols of Durga and her children. “There will be immersions on October 30, as also from October 2-4. Only on October 1, there will be no immersion because of the observation of Muharram. I urge everybody to cooperate with the administration and also with each other so that there was no communal problem,” she said after a meeting with the organisers of the community Durga Puja committees at the Mahajati Sadan. “Please don’t fall into the trap laid by the vested interests, who want to promote their political interests by creating communal problems,” Banerjee appealed. The Chief Ministers asked the Police Superintendents of all the districts to call the organisers of Durga Puja and Muharram in all the localities for discussions and pass her message. “We won’t allow anybody to disturb the secular fabric of our state. I have asked people to take stringent action against trouble makers,” she said.